Dr. Sinchai is committed to providing the highest quality of comprehensive eye care. His medical expertise, surgical precision, and utilization of the most advanced technologies ensures this premium level of care. Dr. Sinchai strives to develop a relationship with each patient based on communication, compassion, and trust. He strongly believes in educating his patients and empowering them to become more informed and involved in their own care. 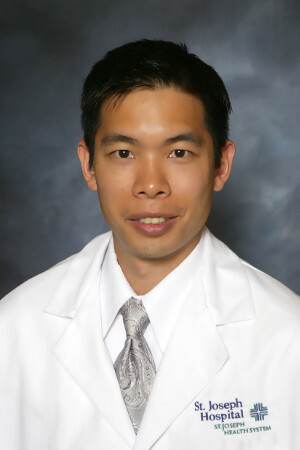 Dr. Sinchai was born and raised just outside of Chicago in northwest Indiana. He graduated with a B.A. in psychology from Northwestern University and received his medical degree from Indiana University. After completing his ophthalmology residency at Georgetown University, he underwent specialized fellowship training in glaucoma at the University of Illinois Eye and Ear Infirmary. Dr. Sinchai began practicing ophthalmology in the Chicagoland area for 3 years prior to his move to Orange County in 2008. After working in the city of Orange for about 4 years, he decided to start his own practice in 2013. He is a member of the American Academy of Ophthalmology, Orange County Society of Ophthalmology and the Orange County Medical Association. Dr. Sinchai and his wife, a family physician, have a daughter. He enjoys traveling, playing golf, watching his daughter play soccer, and is a diehard Chicago Bears, Bulls, Blackhawks and Cubs fan. Copyright 2018 Sinchai Eye Center. All Rights Reserved.